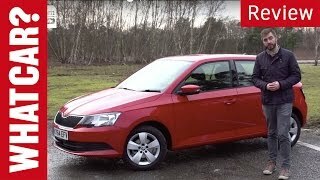 Skoda released its all new revised design of Fabia Hatchback featuring sporty exterior, lower and wider stance and few extra features in the interior. Not only these, company is also offering some extra powertrain options. Let us have a look at Skoda’s perspective and vision while it presents its 2015 Skoda Fabia. Talking about interior of Skoda Fabia 2015, you have a massive sky to pen down its list of newly mounted features. For us the first thing to take the accolades is its spacious interior, let that is horizontally or vertically. Once you find enough space to sit comfortably, seconds from a passenger’s perspective is infotainment segment. A 6.5 inch display features all what you need through MIB technology. With the help of MirrorLink you can quickly pair your smartphone and control them through display screen. Company has used Volkswagen’s MQB technology to design various key aspects in interior, this includes, instrument cluster, assistance systems and electrical architecture at the top of list. 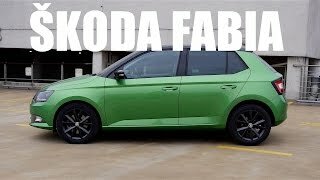 Offering Keyless entry and exit system Skoda Fabia 2015 also houses 17 more features that make it stand ahead of rest in its class like, bottle holders front and rear, holders in trunk, hooks, trash bin, cradle for smartphone, storage nets etc. These entire combined together make the interior of Skoda Fabia 2015 splatter remarkable experience. Exterior of Skoda Fabia 2015 is little shorter, much wider and pretty lower than standard models. Beginning with the front fascia of Skoda Fabia 2015, due to its wide body, headlights get a wider look, while the air dams get accompanied by fog lights. Additional changes are also noticed in hood, pillars and flanks. 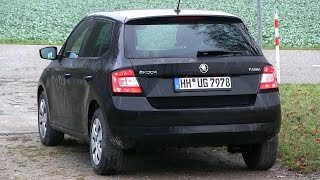 Moving towards the rear fascia of Skoda Fabia 2015, numerous new horizontal design features are noticed that make the round rear a little square in shape. Talking about the revised works, taillights, mirror housings, paint options and wheels bring major changes. Apart rest in the exterior of Skoda Fabia 2015 remains same as that in its predecessors. 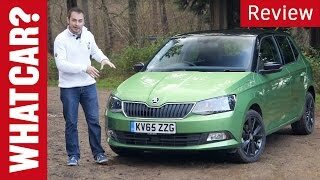 Skoda Fabia 2015 gets aggressive (in options) when it is about power beneath hoods. With 4 gasoline and 3 diesel engines option, Skoda Fabia has given the command in its buyer’s hands to decide their driving experience. For gasoline units range starts with 59 hp and goes till 108 hp engine while for diesel engines it begins with 74 hp and goes till 104 hp, with each of them paired to either manual or automatic transmission. Not only these, there are lot many functions loaded inside Skoda Fabia 2015 to make your driving experience comfortable and luxurious.